The tale goes…long, long ago, before asana was a thing, Yogis meditated for hours and hours and as they complained to their teachers about aches and pains from sitting so long asana was born as a way to prepare to sit. Well, guess what, folks? It still can be. In fact you can do it WHILE you’re sitting. The hour you spend on your mat is, of course, beneficial. But if you sit all day at a desk, you can use these short moves to include Yoga and movement into your full day, to keep your posture light and free and to bring about circulation in the places that tend to get stagnant with prolonged sitting (lower back, hips, shoulders, wrists). These two videos show quick movements that can be practiced in a hall or outside. This video demonstrates a variation of a sitting practice from the Franklin Method. Most of the problems with seated postures come from one simple idea…we slouch, and then we try to “fix” our posture from high up when really, the problem is that we have “tacked down” our base by rolling onto the back of our sitting bones/tailbone. It’s tricky to adjust the spine when you’re sitting on it. So, instead, practice a mindful standing up and sitting back down a few times and awaken the areas that will help you sit well. Using the legs as the fulcrum, instead of using any push down of your hands to get up, scoot forward to the end of your chair, lean forward from your hip crease and use the legs to bring you up. Same thing on the way down as you deepen from the hip crease and let the sitting bones find the chair first. If your base is set, there is no need to adjust or work so hard in the muscles of your back. Because sitting can cause slumping, practice the first move each time you stand to bring about spinal extension and an opening of the front of the chest/shoulders. The second move is a great stretch/circulation builder for the wrists and forearms. To energize the core of the body and the hips, practice the first move. Make sure you scoot to the edge of your seat and bend forward from the hips first before adding the twist. Lastly, when you need a mood booster…or a better breath…or blood to the brain, practice the second move with attention to creating an even curve to the back versus just hinging or falling backward. Imagine the spine to be a bamboo that is bending evenly backward. 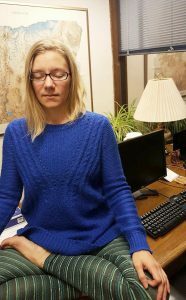 This post is the fourth installment in the 4-part series about teaching yoga in office settings. Check out Part 1, Part 2 and Part 3. This is splendid! Thank you for your work, and for so generously sharing. Next story Who is Chair yoga for?